This is a beautiful amethyst necklace. The three 12mm faceted natural deep violet amethysts are the perfect, perfect, perfect shade of purple. Exactly what you look for in an amethyst, not too dark, not too light...just perfect. I created this necklace completely around my three perfect amethysts. 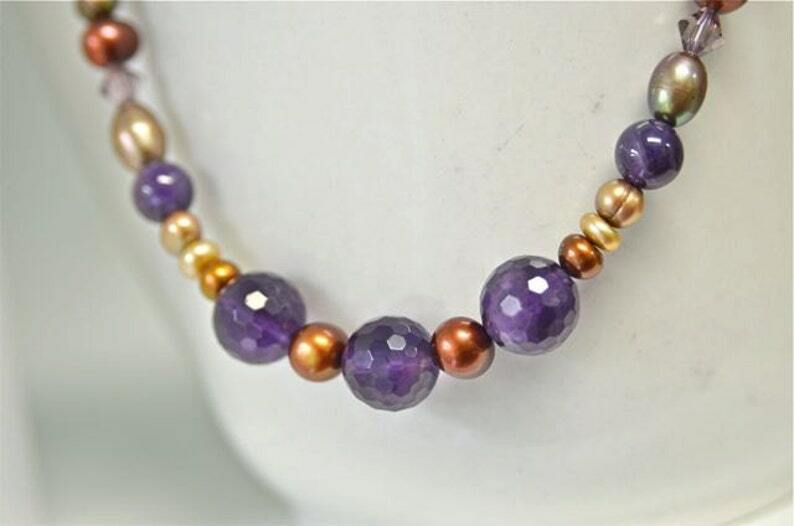 I also used thirty-eight freshwater pearls, six amethyst discs cut in India, six 8mm natural amethysts and fourteen 6mm Swarovski crystals (only the best). This necklace is 18.25 inches (46.4cm) long and has an antiqued brass toggle clasp. All of my jewels are handmade to last a lifetime.